Shane Watson has said he expects his imminent move to number four in the batting line-up to succeed Ricky Ponting in the Test team will allow him to have a bigger impact with his bowling. Watson, the Test vice-captain, confirmed on Wednesday that with Ponting's retirement he would move down the order from three to four with the recalled Phillip Hughes, typically an opener, to bat at first drop, starting against Sri Lanka in Hobart on Friday. 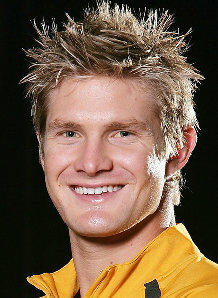 "I really am seeing it as a big positive; one, for my batting side of things, but also for my bowling, to hopefully be able to really contribute that little bit more with the ball because I feel like I have like I have got a bit more to contribute with the ball," the Sydney Morning Herald quoted Watson, as saying. "Batting at number four gives Michael a few more options to be able to bowl [me] towards the latter stages of an opposition's batting innings and not have to worry about me being as fresh as I can going into our batting innings [as he would have to] if I'm opening or batting number three," he added. The 31-year-old said he did not expect to have to make many changes to his batting when facing an older ball immediately.